According to the American Animal Hospital Association (AAHA), 1 out of 4 more pets could be saved if just one pet first aid technique was applied prior to getting veterinary assistance. Will your pet be the one? Knowing the skills and techniques of pet first aid can mean the difference between life and death for you pet. 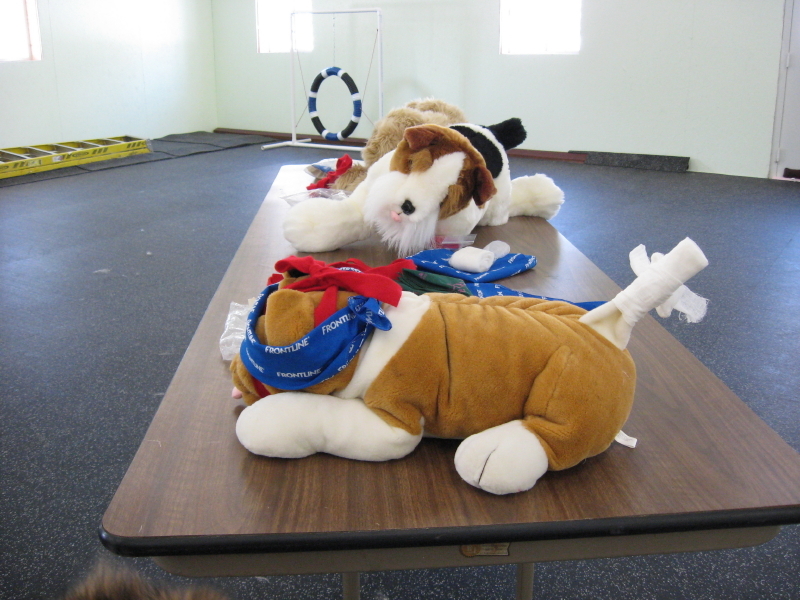 Despite a raging snow storm, eight people gave up their Saturday to spend it learning pet first aid and care at the Canine Coach Training Center. They learned how to restrain an ill or injursed pet, CPR & Rescue Breathing, Heat & Cold Injuries, Bleeding Injuries, Bandaging and MUCH, MUCH MORE!!! Woud you know what to do? On March 26th, 2008, I had an experience that will mark my heart forever. It was during a training session. We were taking a break. The dog lied down while we were talking about what we had just gone over. She stretched her legs out behind her. The owners commented she liked to do that when she was very tired. I started explaining how using brain power can be as tiring as doing something physical, when I noticed a small puddle of urine. I immediately got down on the floor with the dog. She was blue and not breathing. I pulled out her tongue and adjusted her head for a clear airway. She started to breathe again and we rushed to the vet. She didn’t make it. The necropsy revealed a tumor in her heart that ruptured bleeding so much blood into her pericardium her heart couldn’t beat any more. She would’ve turned nine the following week. It was one of those sudden things shocking everyone involved. Something no one could see coming. The tumor could’ve ruptured while the dog slept or jumped off the couch or barked at the mailman or chased a squirrel. Why while she was lying peaceful on the floor of my training center? I got a very touching letter from her owner about a week after the incident. She thought our paths had crossed that day so they wouldn’t have to go through losing their dog alone. It was their first ever dog and therefore their first ever loss. I’ve worked in animal health care for almost 30 years. I’ve experienced lots of losses, my own and through others. I’m also a Pet Tech Pet First Aid Instructor. I knew what to do to get her to the vet so the family could feel like everything possible was done to save their precious friend. As I look back over that day’s events, I think she’s right.